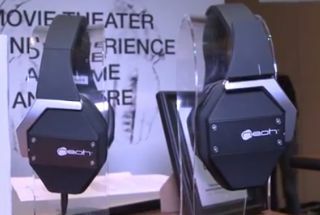 CES 2015: Neoh head-tracking headphones deliver '3D Atmos sound' | What Hi-Fi? These clever headphones aim to bring an Atmos-like experience to your ears through the use of head-tracking technology and digital sound processing to replicate hearing up to 25 speakers. On show at CES Unveiled, the Neoh headphones from 3D Sound Labs were described as the Oculus Rift of the heaphone world but seemed a little more like Dolby Atmos in a set of earphones to us. The headphones use head-tracking technology to move the sound around you as you move your head. Your source device is 'home'; if you turn away from your TV, PC or music player, the sound will appear to come from behind you. That's the theory at least. There are sensors on the headband, while all the clever digital surround processing - 3D sound if you like - is done by a companion app. 3D Sound Labs says the system can replicate the sound of up to 25 speakers and move sound all around your head - a bit like the Atmos cinema systems. 3D Sound Labs will be seeking crowdfunding later this year in an effort to get this technology on the market, though the guys on the stand at CES 2015 seemed quietly confident that the tech would come to market whatever the outcome of that funding. We shall see.